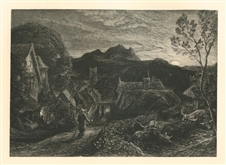 Samuel Palmer original etching "The Early Ploughman"
Medium: original etching. Catalogue reference L 9. 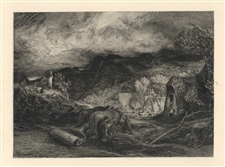 This Samuel Palmer etching was published in London in 1868 for P. G. Hamerton's rare first volume of "Etching & Etchers", and printed on laid paper. Image size: 5 1/8 x 7 3/4 inches (130 x 195mm). Considered one of Palmer's finest compositions, and now quite scarce. Not signed. Medium: photogravure (after the watercolor). Samuel Palmer had always admired the work of John Milton, and executed a suite of watercolors which were made into photo-engravings for "The Shorter Poems of John Milton" published in London in 1889. The image measures 5 x 7 inches. The title is printed beneath the image. Not signed. Condition: in good condition, with a few spots but without the heavy foxing often seen with this work. There is a library stamp partway inside the platemark but well away from the image (see the second photo).